You may already be taking down the tree, deciding what to wear on New Year’s Eve and getting the kids ready to go back to school. But, in Spain, Christmas is just getting started! The twelve days of Christmas begin on December 25 and finish on the eve of January 6, the holiday of the Reyes Magos, when the three kings arrive from Bethlehem bringing gifts for good children. And, on the fifth day of Christmas, only FIVE GOLDEN RINGS remain of the dozens of roscos made by my friend Antonia. Cherished at Christmas, homemade roscos are somewhere between a cookie and a doughnut. 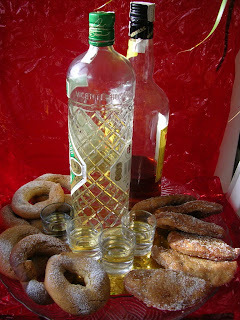 Typically, they are served with aguardiente, anise liqueur, brandy and sweet wine. Antonia lives in the village, but frequently spends weekends on the farmstead in the country where she grew up. During the holiday season, she and friends fire up the horno de leña, the old wood-burning bread oven, to make roscos de huevo, egg doughnuts, enough to last the twelve days of Christmas. Antonia prepares a dough using a dozen eggs, a kilo (2.2 lbs) of sugar, a cup of honey, grated lemon zest, baking soda, about 2 cups of oil (olive or sunflower) and flour, about 3 kilos (about 6 ½ lbs). The eggs are separated and the whites beaten stiff, then folded into the dough to lighten it. She rolls out ropes of dough, pinches them into rings. The roscos bake in the residual heat of the brick oven, initially fierce, then slowly cooling. They’re not overly sweet, have a subtle smoky flavor. Sometimes they are dipped in a honey syrup, but they are delicious unadorned for dipping into sweet Málaga wine or Sherry. Other typical homemade Christmas sweets come not from the oven but the frying pan. Such are the empanadillas, little fried turnovers, that Carmen makes. She prepares a soft dough using olive oil, white wine, sweet Málaga wine, cinnamon, a bit of sugar and flour. She rolls out circles of dough and places a spoonful of sweet potato filling on each. The filling she made earlier—sweet potato puree cooked with an equal weight of sugar, flavored with cinnamon and aniseed. She folds the dough over the filling, making half-moons, and crimps the edges. 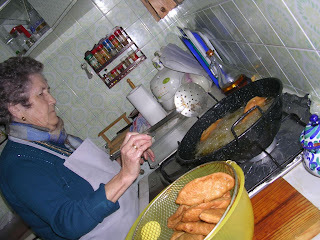 The empanadillas are lined up on a tray as she heats the oil in a deep frying pan. For the frying, she prefers sunflower oil. Olive oil, she explains, turns them darker. Carmen fries up dozens of the little turnovers. She drains them on paper towels, then sprinkles them with granulated sugar. Many are special-ordered for family gatherings during Christmas. 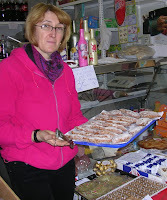 The rest are sold by her daughter who has a stall at the local market. My recipes, below, for roscos and empanadillas, while not identical to Antonia’s and Carmen’s, are traditional homemade Christmas goodies. By the way, those fried turnovers would be ideal for Chanukah, so save the recipe for next year! Sift together the flour, baking powder, and cinnamon. Combine the oil, wine and sugar in a mixing bowl and whisk to blend. Add the zest, sesame seed, and salt. Stir in the dry ingredients to make a soft dough. Turn the dough out on a lightly floured board and knead until the dough is shiny, about 4 minutes. Divide the dough into 24 walnut-sized balls. Roll each ball into a cord, about 6 inches long and ½ inch thick. Pinch the ends together forming a ring. Place the rings on baking sheets lined with parchment. Bake in the middle of the oven, changing position of sheets once, until rings are lightly golden, 40 to 45 minutes. Cool the rings on a rack. Sift confectioners’ sugar over them. Makes about 28 small turnovers. Heat the oil in a small skillet with the orange peel. Remove from heat, cool for 1 minute. Remove and discard the orange peel. Then stir in the sesame seed and aniseed. Pour into a mixing bowl and allow to cool. Add the cinnamon, cloves, wine, brandy, orange juice and salt to the oil. Using a large wooden spoon, stir in the flour to make a soft dough. Turn out on a lightly floured board and knead very briefly, just to combine well. Let the dough rest, refrigerated, for at least 1 hour or up to 12 hours. Roll out the dough thinly on a lightly floured board. Prick the dough all over with a fork. Use a 4 ½ -inch cookie cutter to cut circles. Working with one disk at a time, place a spoonful of pumpkin jam on one half. Moisten the edges of the dough with water, then fold the circle in half, enclosing the filling. With fingers or the tines of a fork, crimp the edges together firmly to seal the turnover. Place on a tray. Continue filling and shaping the remainder of the dough. Heat oil in a deep skillet to a depth of at least 1 ½ inches. Fry the turnovers, four or five at a time, until they are golden brown on both sides. Remove and drain on paper towelling. Dredge in sugar while they are still hot. Let the turnovers cool completely. Make this jam also with sweet potatoes. Use it with breakfast toast or as a filling for pastries. Makes about 2 ¾ cups of jam. You will need a small pumpkin or other winter squash weighing 2 ½ -3 pounds, to obtain 2 cups of cooked pulp. Steam it until tender and drain before pureeing. Place in clean jars and seal. Cool completely, then refrigerate. Use within two weeks. At my house in southern Spain, holiday cheer is an evergreen tree glowing with bright golden ornaments. 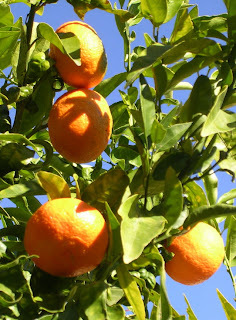 That would be the clementine tree on my patio, or the lemon tree on the edge of the vegetable garden or the neighbor’s pair of orange trees right above me. 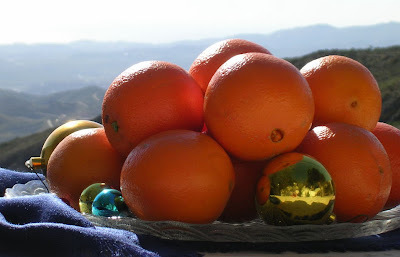 In Spain, citrus trees laden with fruit herald the winter holidays. The gorgeous fruit finds its way into capacious Christmas stockings, into bowls, and onto festive holiday plates. Fresh-squeezed orange juice is pure bliss for a holiday breakfast or combined with bubbly cava for parties. Big kids and little kids adore the juicy clementines, those easy-to-peel tangerines, with their tangy-sweet flavor. My son Ben, home last weekend with an incipient cold, ate about a dozen of them (and seems to have beat the flu bug, though the big dose of vitamin C did not protect him from injuring his knee while surfing). Last year I spent the holidays with my other son, Daniel, and his family in Atlanta. At a nearby supermarket, I found boxes of Spanish clementines at a great price. We went through crates of them before the stocks disappeared. I go way back with my “orange Christmas.” Years ago, when I lived in a ramshackle village house, every winter I made marmalade with the bitter Seville oranges that grew in the back garden. Marmalade making was a three-day procedure, allowing the sliced oranges to soak, cook, and soak again in order to develop the pectin. I gave marmalade away as gifts and sold jars of it from my house. I’m posting two citrus recipes. One is an adaptation of a salad found in tapa bars in southern Spain (called remojón, salmorejo or ensalada malagueña, depending where you are). The traditional recipe calls for bacalao, salt cod, which is toasted and shredded, topping the oranges. My version uses shrimp and I serve it as a starter for Christmas dinner. 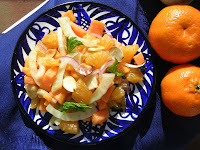 The other is also a salad, a contrast of juicy clementines, crisp fennel and smooth sweet potatoes. It makes a fine side dish on a buffet table. I took it to a brunch while visiting friends in Seattle last New Year’s. A photo of this salad (by Michelle Chaplow) appears on the front cover of my newest cookbook, TAPAS—A BITE OF SPAIN (see the column to the left; click to order the book from Santana Books). Arrange salad greens on individual salad plates. Slice the oranges and cut into bite-sized pieces. Arrange them on the greens. Scatter the onions on top. Arrange the olives on the oranges. In a small bowl, combine the garlic, oil, vinegar and chile. Scatter the shrimp on top of the oranges. Drizzle with the dressing. Allow to stand 30 minutes before serving. Serves 6 as a starter or side. Peel the sweet potatoes and cut them into ¾-inch cubes. Cook in boiling salted water until just tender, 4 to 5 minutes. Drain, refresh in cold water and drain again. Place the sweet potatoes in a bowl and add the wine vinegar, ¼ teaspoon salt and pepper. Cover and allow the potatoes to marinate at least 1 hour and up to 24 hours. Trim the fennel of stalks, saving sprigs of the green fronds for garnish. Quarter the bulb, then thinly slice crosswise. Add to the sweet potatoes. Remove skin and white pith from the clementines. Chop them and add to the sweet potatoes. Place salad greens on plates. Scoop salad on greens. Scatter sliced onions and hazelnuts, if using, over the sweet potatoes. Garnish with sprigs of fennel greens. A few weeks ago I wrote about the big, fat Spanish olives that I pick from my trees, put to soak until they are sweet, then cure in garlic-seasoned brine. I said I’d report back on the success of the various batches. So, here are the season’s tasting notes, plus, I am re-posting the original article, as it had code embedded in the text. I made three jugs of olives, all of the large Manzanilla variety. The olives in the first were rayadas, incised with a blade, then soaked in water for about three weeks. I prepared a brine according to my own directions below—7 tablespoons salt for every 4 cups of water. The olives turned out nice and crisp—but they’re quite salty. Now I’m diluting the brine and placing the olives in smaller jars. The second batch I prepared in the traditional manner—smacking them with a stone to split open the flesh. I used less salt, only 5 tablespoons for every 4 cups of water. These olives are soft, a little mushy. I think the cracking technique is better suited to a firmer variety of olives. For the third jug, I used a tool to pit the olives. Picked green, they are firm enough to stand up to pitting. They needed less than two weeks in water to sweeten and they have a great texture. Plus, now I can stuff them with strips of piquillo pepper, anchovies, pickled garlic. I like to tell my guests that the olives they are nibbling come from the tree they’re sitting under. But, no, don’t reach up and pluck one! Straight from the tree, they are impossibly bitter and astringent. Olives need a curing process to make them edible. That’s what I’m doing this week, picking, sorting, cracking and soaking olives that will become table olives, eating olives. 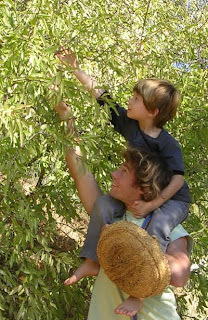 They are picked green—soon after the first fall rains soak the parched earth and plump up the olives. 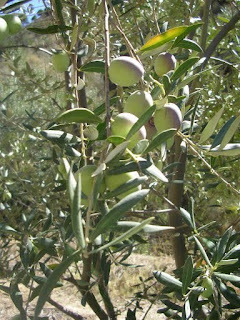 Most of my olive trees are varieties usually pressed for oil. But I have several Manzanilla trees that produce big fat, fleshy olives, the same kind you usually find in jars at the supermarket. But the home-cured ones are very different from commercial olives. Commercial olives are soaked in an alkaline solution (lye) to remove the bitterness. The home-cured ones require nothing more than water and salt, plus seasoning. 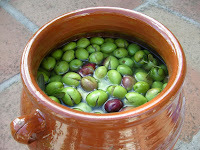 I prepare my olives in the Andalusian style that I learned from local country people many years ago. I place the olives in small earthenware jugs, orsas. I cover them with water. Just water at this stage. I use non-chlorinated well water. It’s extremely hard water (high in calcium, demonstrated by limescale on my kettle), which I think may help keep the olives crisp. I drain off the water and refresh it every two or three days until, when tasted, the olives are no longer bitter. Defining bitter is definitely subjective. I bought some cured olives at the market a few days ago that I would say were still really bitter. It’s a matter of taste. I let mine soak, changing the water every few days, until they are really sweet. That takes about three weeks. Now comes the flavoring. 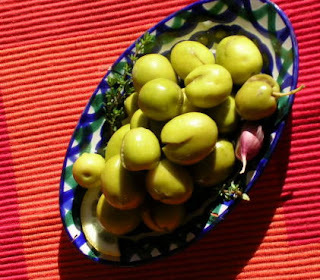 In my village, traditional flavoring for olives includes quartered lemons, unpeeled cloves of garlic, sprigs of thyme and flowering bracts of fennel. Elsewhere in Spain, I have sampled olives flavored with strips of red pepper, chile, oregano, vinegar. Although the olives are ready to eat in a few days, flavor develops as fermentation continues. After about a month, I pack the olives into clean jars and refrigerate them. Without conservatives, they last for many months. That is, they last if I haven’t given them all away by Christmas. Friends say they are the best olives they have ever tasted. You can buy home-cure style olives from open stock at many markets in Spain. They are dipped into plastic bags along with some of the brine. Olives travel well—drain off the brine, then put them in a fresh brine when you get them back home. You can add flavor to bottled, store-bought olives. 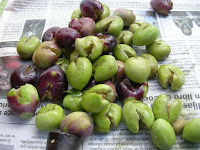 Buy unpitted Seville olives (big Manzanillas). Drain them and rinse well. Marinate them for two days with slivered garlic, salt, sprigs of fresh or dried thyme, a sliced lemon and a little extra virgin olive oil. In Spain, olives are enjoyed as a tapa and alongside meals. 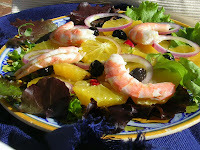 They top typical salads, from mixed greens to exotic orange, onion and salt cod. 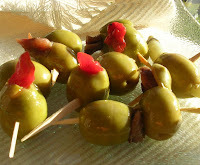 They are used rarely in cooking, although duck with olives is a Seville classic. Olivada is an olive pâté, sensational spread on toasts. This is best made with home-cured brined olives (squeeze them to remove the pits), but pitted olives from a jar can be substituted. Serve this olive purée as a dip, sandwich spread or sauce to accompany roast lamb, grilled fish or boiled potatoes. The spread keeps, refrigerated, for a week. Combine all ingredients in a blender or food processor. Blend until smoothly puréed. Serve cold or room temperature. Like a busy squirrel, come fall I scrabble about in the dry leaves, pocketing handfuls of almonds that have fallen from the trees above my property. High winds and rain bring them down onto the narrow terrace where I hang out my laundry on a line stretched between two old olive trees. Even though I’ve still got a basketful of almonds left from last year, I can’t seem to restrain myself from gathering more. The delight of searching for them and the pleasure in eating them make me a little obsessed. Now, with heaps of them to crack and shell, I spread out a newspaper on the floor and work on them while watching the news on TV. 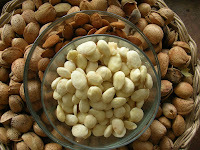 Almond gathering begins as early as August, when the fresh nuts are perfect for crushing to make garlicky white gazpacho, ajo blanco, a specialty of Málaga province where I live. Served chilled with sweet moscatel grapes as a garnish, it’s a marvelous contrast of flavors. Lightly toasted in olive oil and sprinkled with a touch of salt (I add a pinch of cumin as well), almonds make a near-perfect aperitif with dry fino Sherry. They also are blanched, skinned and crushed with garlic and saffron to make an outstanding sauce for chicken, fish or vegetables. And, famously, almonds are the prime ingredient in Spanish turrón, nougat candy, and marzipan, both essential for the holiday season. Toledo is especially famous for its marzipan confections, sculpted into tiny swans or rabbits, big spirals known as eels, little cakes with egg cream filling. Artisanal marzipan is made from two varieties of sweet almonds, the oval largueta, which contributes intense aroma, and the round marcona, exceptionally rich in oil. Spanish marzipan does not contain bitter almonds. 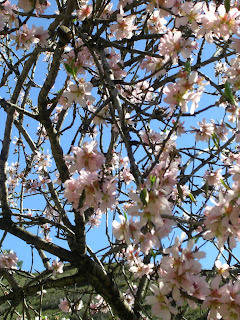 Spain is the second largest producer of almonds, after California. But it uses so much in confectionary that it imports almonds as well. This recipe for melindres is a simple marzipan—really just ground almonds and sugar. It makes a delightful Christmas cookie. If you grind your own almonds, after blanching and skinning them, toast them briefly in the oven to dry them thoroughly. You can substitute unsweetened almond meal. Add only enough water to make a mixture that sticks together—very little in the case of fresh almonds, more for floury almond meal. One egg white makes enough glaze for a double batch of cookies. If preferred, use ½ egg white, ½ cup confectioners’ sugar, and ½ tablespoon lemon juice for the glaze. Combine the almond meal and granulated sugar in blender or processor and grind until very smooth. Add water, one teaspoon at a time, processing until the almond mixture forms a smooth mass that sticks together. You will need 8 to 10 spoonfuls of water. Turn the almonds out onto a marble slab and knead briefly. Divide the almond mixture into balls about the size of a pecan. Roll each one into a cord, 4 ½ inches long and about 3/8 inches in diameter. Bend the cord to make a circle, pinching the ends together. (If almond mixture breaks, just pinch together the broken bits.) Place the rings on a baking sheet lined with parchment. Bake the rings 10 minutes. Cool them on a rack. Combine the egg white and sifted confectioners’ sugar. Beat at high speed for 3 minutes. Add the lemon juice and beat 2 minutes longer. Dip the rings into the egg white glaze. Use a skewer to drag the rings through the egg white. Lift the rings out and let excess drip off. Place them on a baking sheet and return to the oven for 8 minutes. Remove and cool the rings on a rack.